Leslie and I have been using Couchsurfing to find accommodation during our travels for two months now (read about our first Couchsurfing experience). Most of the time our experiences have been amazing. We’ve met interesting people, experienced parts of cities we otherwise wouldn’t have, and most importantly made many new friends. Not to mention we have been able to spend more of our travel fund on food/activities rather than accommodation. We do not blame the Couchsurfing host entirely for this situation, as we could have done more to prevent it from happening. Holding a grudge against the host would be pointless. In fact, thanks to this negative experience we ended up having a better time in New Orleans than if it hadn’t happened at all (I’ll explain why at the end of the post). Regardless of how things turned out (as they say, hindsight is 20/20), our entire trip could have been ruined due to this experience. For that reason, I decided to write this blog post as a lesson for all Couchsurfers out there. I hope you are able to learn from our experience so that it will not happen to you in the future. It all started a week before we left for our East Coast road trip. 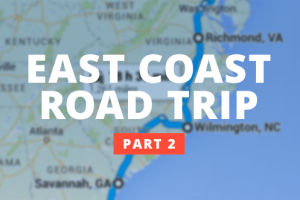 In order to prepare for our 30-day road trip, Leslie and I decided to start figuring out our accommodation for each city before the trip even began. So regardless if it was the first city we would visit, or the last, we chose to get as much planning done as early as we could. This meant researching neighborhoods, scouring Airbnb for a few unique apartments, and finding Couchsurfing hosts that we thought we would get along with. When it came time to find a host in New Orleans, we messaged three potential hosts. First we started with a template message that explained that we are a couple taking a gap year, when we planned on being in their city, and some of our Couchsurfing experiences to date. Then we personalized the message with some similarities we found on their profile and why we would like to stay with them. For this host specifically, we noticed that their profile mentioned they could only host 2-3 days at a time. So even though we were asking for four nights, we made sure to mention that we understood they only hosted for that amount of time and explained that we requested all four nights so they could pick the ones that worked for them. 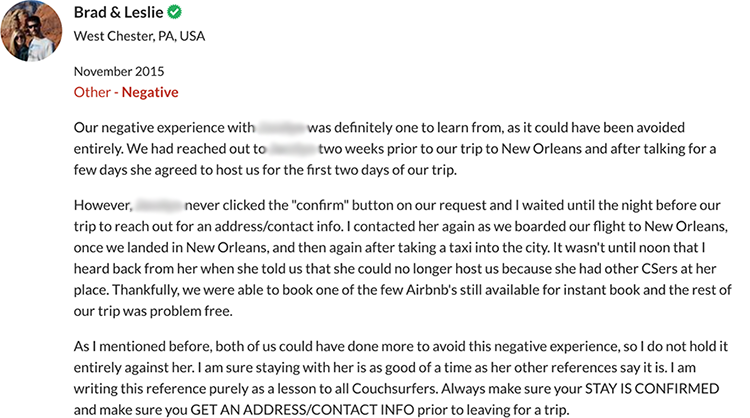 A few days went by and we still had not heard back from a host in New Orleans. So we decided to send a second message respectfully asking if they received our first message while acknowledging that we realized it was still early. Thanks to our second message, one of the hosts in New Orleans ended up responding to our message. They explained that they did get our first message, but that they were waiting to get their work schedule before committing to hosting us. A few days later the host reached out to us again and offered to host us November 10-12th (as long as we arrived before the evening on the 10th). The next morning I quickly responded to let them know we appreciated that they accepted to host us. I also made sure to confirm the dates, because I was confused if they were offering to host us on the 12th or not. Finally, I gave them our flight details and asked what the best way to get from the airport to their house was. That same day they responded confirming that they could host us for the 10/11th. Even though it wasn’t for our entire time in New Orleans, we were very happy that they could host us the first two nights of our trip. (which gave us peace of mind, knowing that we didn’t have to worry about having a place to stay upon arrival in New Orleans). This is where I made a huge mistake. Whether I was caught up in the rest of our trip or I simply forgot, I did not contact the host again early enough before we were supposed to stay with them. The night before we were flying to New Orleans I realized I didn’t have the phone number or address of our host. At this point I knew I had messed up, but I was confident we would hear back from the host in the morning. By the time we boarded our flight in Ft. Lauderdale, we had still not heard back from our host. So I messaged them again. 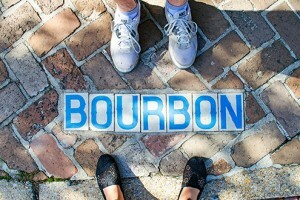 By the time our flight landed our in New Orleans, we had still not heard back from our host. So I messaged them again. Instead of grabbing a taxi right away, we decided to hangout at the airport for an hour or so (at least we had free airport wifi). Eventually we started to get hungry, so we decided to head into the city to have lunch. I again messaged the host, hoping they would see the notification and respond. However, we had still not heard back from the host by the end of out meal. But then, just a few minutes later around noon, my phone vibrated with a notification from our host. Finally they had responded, instantly filling me with relief (if only for a few short seconds). At first, I was confused. I knew it had been awhile since we had talked, but they had clearly told us they would host us the first two nights of our trip. But then I thought, maybe she just means we have to wait a little longer until the other hosts leave the house. Within seconds of hearing back I responded asking if they were still hosting us. However, their next message would confirm the bad news…we were in New Orleans and we didn’t have a place to stay. At this point I wasn’t sure what to do. Trying to keep my composure, I responded one last time hoping they would change their mind or at least offer a recommendation for somewhere to stay. Instead, they answered with two words: “try Airbnb.” Even though they had been apologetic in responses, I was upset at this point. Leslie and I had researched apartments on Airbnb prior to our trip, however the ones we liked were all booked by the time we needed them. With most available apartments $150+ per night, we were left with few options. To narrow the selection further, we chose to only look at apartments that could be booked instantly (or else we figured it could take hours for a host to respond). Luckily, we were able to find an Airbnb that we could instantly book for $75 a night and it was just a few blocks away from where we were. After booking the apartment I figured I would let the Couchsurfing host know we found a place to stay. I also asked if they could host us the last two nights of our trip (call me crazy, but I thought they might offer because of the situation we were in). But of course, they chose to not respond and our new request fell on deaf ears. Two days later they ended the conversation by simply hitting decline on our request. I waited until the day after our trip to New Orleans to write our negative reference for the host. Realizing it was partially my fault for not reaching out sooner, I tried to be respectful with my reference and not put all the blame on the host. In my reference I explained that we had reached out weeks ahead of time and had confirmation they would host us for the first two nights of our trip. I explained how we were both at fault for the situation and that staying with them is probably as good of a time as the rest of their references say it is. To finish the reference I explained that the main reason I was leaving the response was to make sure other Couchsurfers learned from our experience. I wanted them to know they should always make sure their stay is confirmed and to get an address/phone number well in advance of their trip. Since I was leaving a negative reference on their profile, I expected to get a negative reference back as well. However I must say, I was shocked (to say the least) by their response. While you had responded to our request with a “maybe” on October 24th, you later confirmed you would host us November 10/11th (first on October 27th and then again on the 28th after I had messaged you to be sure of the dates). Now, I would have understood if you had told us you were cancelling on us due to a family/work related reason (who knows maybe your kid was sick or something came up at work). But that was not the case, instead it was because the Couchsurfers you hosted the night before were “stood up/left high and dry” by their next hosts. I’m not sure how other people would think about this situation, but I don’t see how what you did to us is any different from what the other hosts did to the other couchsurfers. By cancelling on us for the other couchsurfers, you were standing us up and leaving us high and dry. While I may be new to Couchsurfing, I am not new to staying in someone else’s home (in fact, I have been active on Airbnb long before you created your Couchsurfing profile). I do believe there is a difference between someone “invading your life/space/home” and someone you invited into your home. No, I was not “expecting you to throw your guests out so you could host us”. Instead, I was expecting you not to have other guests since you had already agreed to host us. Hell, maybe I thought you might find a way to host both of us…so neither of us would be left high and dry (even if it was just for one night). 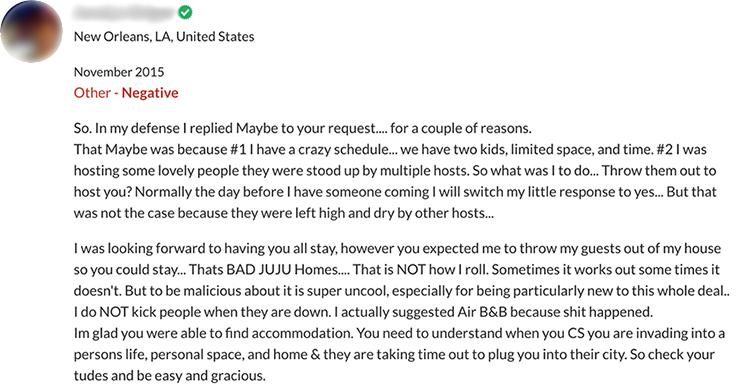 As for “being malicious” or “checking my tude,” I thought the final part of my reference made it clear that it was both our faults and that I was writing my reference so other couchsurfers could learn from the experience. So I am sorry that it came off as “malicious” to you and hope this blog post makes my intentions clear, as well as objectively represents the situation. First, if someone tells you they will host you during your trip, then make sure they hit the confirm button on your request. Second, always get the phone number and address of your host several days before you are supposed to arrive. Third, have a backup plan (whether that means contacting other Couchsurfing hosts, researching Airbnb’s, or finding the cheapest hotel around). Finally, do not think that this single negative experience (or the handful you have read about online) is representative of all Couchsurfing experiences. Every other Couchsurfing experience we have had has been amazing, whether we were staying with someone or just meeting up with them to hang out. In fact, we ended up staying with another Couchsurfer named A.J. who offered to host us last minute for the final two nights of our trip. Looking back at this experience and knowing everything worked out, I believe our trip turned out better than it could have had the other Couchsurfer not cancelled on us. By booking the Airbnb we did (which was a new yoga studio in town), we were able to support a local business when they needed it. Not to mention we would not have met A.J. who turned out to be our favorite host to date (which includes both Couchsurfing and Airbnb). Have you used Couchsurfing before? How have your experiences been? Let us know in the comment section below! 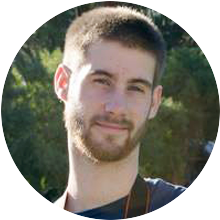 Choosing to spend his childhood outdoors with friends, rather than indoors playing video games, Brad has been an explorer since a young age. At University he studied abroad twice: spending four months in Florence, Italy, as well as, ten days in the Czech Republic. 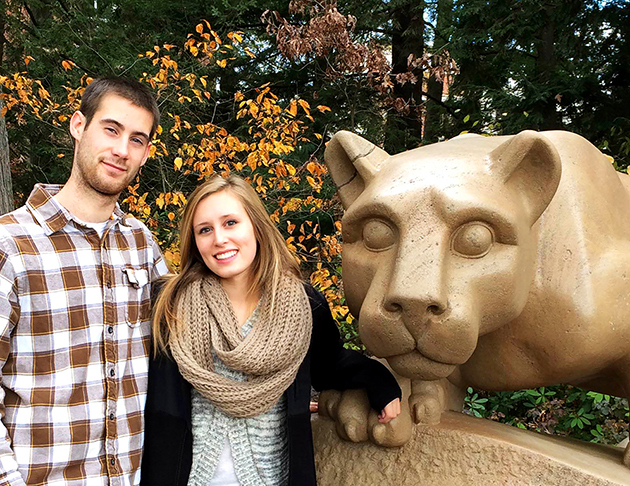 With University behind him, he would rather hit the road for another trip instead of settling down into a career. I am really enjoying your blog. Safe travels, and have a good holiday. Thanks Joan! We are having a blast on the road and look forward to returning home for the holidays! I hope we can all get together sometime soon!